Half of Americans think it is inappropriate for journalists to cite anonymous sources in their reporting, and many think reporters are simply making up those sources. But as stories purportedly based on leaks from within President Donald Trump’s administration continue to be published daily, half of Americans also view the coverage by U.S. media organizations as accurate, according to a new Morning Consult/POLITICO poll. Only about a third of Americans (32 percent) said they think it’s appropriate to use anonymous sources when reporting on government business, while 50 percent do not. Support was considerably higher among self-described government employees: 41 percent said it was appropriate, compared with 37 percent who said it wasn’t. Some of the leaks in the Trump administration have been trivial, such as anecdotes depicting aides stumbling around in the dark, or about Trump being concerned with how his press secretary, Sean Spicer, dressed. Other revelations, such as those about government investigations of Trump’s associates and Russia, have rattled his administration, leading to the resignation last month of National Security Advisor Michael Flynn. Trump has repeatedly launched verbal attacks on journalists via Twitter, as well as in front of cameras during his remarks at the Conservative Political Action Conference last month. In one tweet, he even called on The New York Times to apologize for using leaked information. At other times, Trump has suggested journalists make up their sources, and this seems to hold considerable currency with some voters. 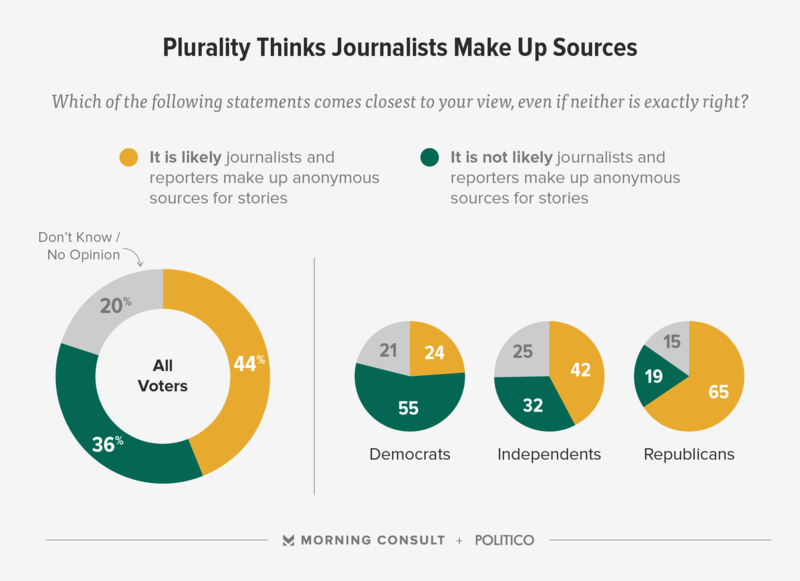 More than 4 in 10 (44 percent) said it is likely journalists and reporters make up anonymous sources for stories, compared with 36 percent who said it is not. Partisan divides are apparent on the issue. While 65 percent of Republicans said journalists made up sources, only a quarter of Democrats (24 percent) said that was the case. Those divides were also present when voters considered whether media organizations cover political issues accurately. Three in 4 Democrats viewed the media’s coverage as accurate, while 63 percent of Republicans view it as inaccurate. And most voters (56 percent) said it was inappropriate for government officials to refuse to speak to media organizations just because they disagree with their coverage, including 35 percent of Trump’s 2016 voters. Another 52 percent of Americans said it was inappropriate for those outlets to be excluded from press briefings, a move employed by the White House last month. Roughly 6 in 10 Americans (59 percent) said it is inappropriate for government officials to make negative comments about journalists whose coverage they do not like. The national, online survey polled 1,992 registered voters from March 2-6. It has a margin of error of plus or minus 2 percentage points. See the full crosstabs here.